Something Old and New, Borrowed and... GREEN! : It just has to be this. Every time I see a cake with this design I stop and I smile and I think to myself "This just has to be the cake that I have on my wedding day!" 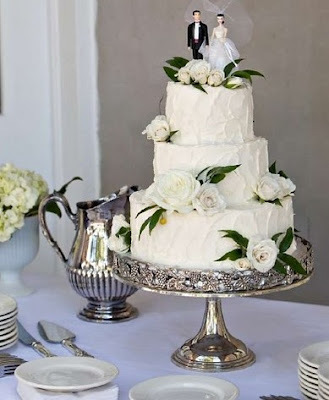 I think it may also be that I HAVE to have a vintage cake stand to go with it as well... I wonder if AJR will let me buy one off ebay? Saturday we have a meeting with the man who will be making our cake... I am excited to discuss options and see what kind of fun flavors and things we can come up with!